To celebrate the Holiday season, FLEX alumni in Montenegro maintain a tradition of exchanging gifts through a Secret Santa gift exchange, which they learned about in the U.S. during their respective exchange years. This year, the alumni continued their tradition of celebrating Christmas in a very American fashion! Reflecting on their magical experiences in the U.S., alumni spent a wonderful Saturday evening exchanging heartwarming presents. Each participant had one assigned friend to buy a special gift for, not knowing from whom they would be receiving a present. 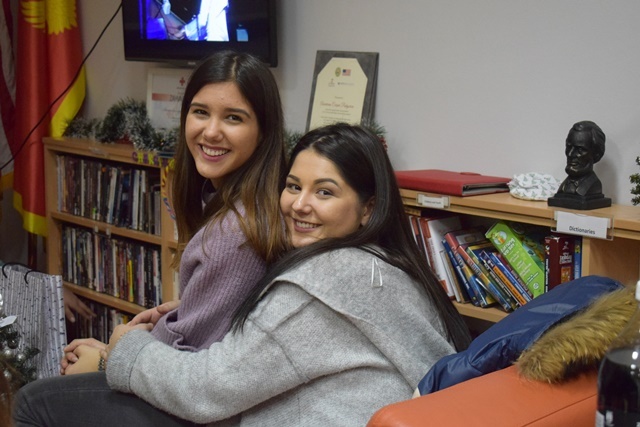 After gathering at the American Corner in Podgorica and enjoying some holiday treats, alumni sat down in a circle to reveal who their Secret Santa was. Among 20 participants, no one was left unsatisfied! Some received winter essentials, some got some pretty good laughs, and some were incredibly surprised by how well their peers knew them! Alumni did exchange gifts, but most importantly, they exchanged hugs, love, and friendship. Alumni not only enjoyed the act of giving and receiving gifts, but also appreciated merely spending time together. Alumna Sara Dubljevic ’16 (Niksic, Montenegro/ Moweaqua, IL) said it was lovely to see everyone gather again after being away at university or separated because of various responsibilities. The holidays are her favorite time of the year, knowing that all her friends will gather to share the spirit together. Another alumna, Milica Knezevic ’15 (Cetinje, Montenegro/ York, SC) said it was great to get to know the youngest generation of FLEX alumni, as well as to catch up with the older crew. This tradition allows alumni to truly get to know each other and to create unbreakable bonds, motivating them to come to all future FLEX alumni events! The FLEX Alumni community in Montenegro plans to continue the Secret Santa tradition every year.